You might catch a little air while flying down into the cool pool of water at the bottom of this water slide. 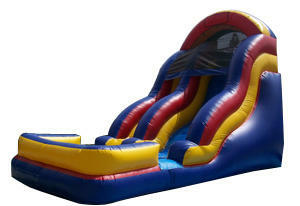 Kids, teenagers and adults love this slide.The pool area has inflatable soft bottom so it can be used wet or dry. Actual Size 14 FT. 25 FT * 18 FT.